Here’s a DIY wedding project that packs a big punch. Favor bags made from fabric ribbon beat out plain organza bags hands down, and they’re easy to whip up. When you incorporate them into your table setting, they double as decorations for your tablescape. And, OK, we’re extra partial to this fab idea because it comes from our new sister site, Sew Jewish. Get the instructions. Give tzedakah instead of party favors – We can change the world! Couples planning weddings typically spend 3% of their budgets on party favors for their guests. If that money went to tzedakah (charity), we could change the world! U.S. wedding expenditures are about $40 billion dollars per year. Three percent of that is $1.2 billion. Imagine $1.2 billion more dollars going to charitable organizations each year. That’s much ka-ching could do a lot of good. And we’re talking about a way that couples can give charitable contributions without adding a dime to their wedding budget. What’s not to love? 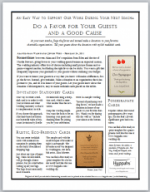 I so much love the idea of couples making a charitable donation in honor of their guests in lieu of buying wedding favors, that I turned an article of mine on the subject into flyers for distribution by charitable organizations or anyone else who wants to help spread the word. There are three versions each with a different headline, so you can choose the one that works best for your organization. They are free to print, download, and distribute. Donations could be made to any type of organization, of course, but because the article originally appeared in the Washington Jewish Week, the article has a Jewish bent. Having done a short stint in fundraising, I hope that the idea will take off and be an added source of support for the Jewish institutions who do so much good for our communities. 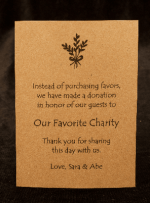 Instead of giving wedding favors to your guests, make a donation to your favorite charity in your guests’ honor. Tell your guests about the donation on cards placed on the reception tables. 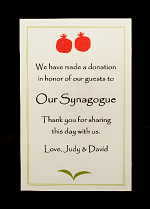 Find free printable templates for charity (tzedakah) favor cards at Huppahs.com.